My life with hydrangeas did not begin well. When I moved to Grinnell Street in 1971 several tortured and overgrown white hydrangeas grew in front of the porch. I don’t know what kind they were but they did not please me. I cut them down, and ultimately planted three dwarf apple trees in the narrow space between the sidewalk and the porch. This was probably not a good idea, but we moved to Maine in 1974 so the problem was not mine, and the new owner did remove those trees. It was not until about 15 years ago that I noticed and fell in love with the virburnams with their early spring lacecap blossoms. I did plant a viburnam, or highbush cranberry, to get bigger lacecap blossoms, but I also saw that some hydrangeas had airier blossoms than those on the dense mopheads. Then, while visiting Nasami Farm one day I saw a very airy hydrangea there named Mothlight, and because it was hardy to Zone 3, I bought it and planted it in my new Lawn Bed. I soon realized that I made the mistake that so many gardeners make and did not picture my Mothlight as a mature plant. Mothlight is planted on the east side of the Lawn Bed and only about 6 feet away from the west side of the bed where I planted a weeping birch. It seemed like a lot of space at the time, but it is not. I am happy to say they are both doing very well, but the weeping birch is weeping towards the east, and I had not envisioned the Mothlight achieving a height of over eight feet. Mothlight blossoms are not lacecaps, but they are more airy than mopheads. It is the stature of the shrub itself that I had not planned for. Fortunately the Mothlight hydrangea belongs to the Hydrangea paniculata family. 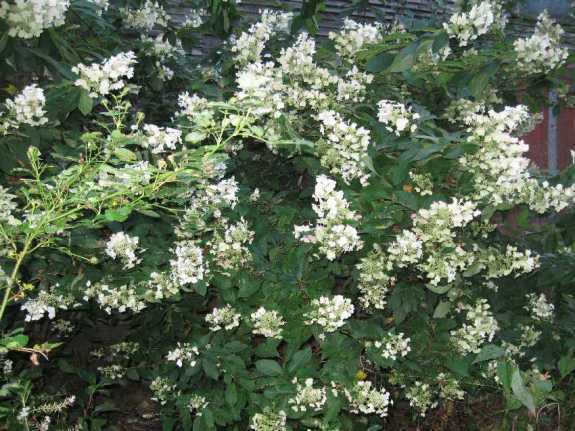 The word paniculata refers to the shape of the blossom which is kind of cone shaped. One trait of this group of hydrangeas is their tolerance of pruning. They can be pruned in the fall or the spring. They are the only hydrangeas that can be pruned into a tree shape. So I have pruned the ‘backside’ of Mothlight to keep it somewhat out of the way of the weeping birch and so they march on together. Needless to say, these hydrangeas do not need to be pruned every year, especially when they are young. Dead or crossing branches can be taken out at any time. Much of the pruning I have done on Mothlight is to control the size and shape. I have also planted other hydrangeas. After coming to the realization of how big and dense the shrubs can be, I planted three at the eastern edge of the lawn where I imagined they would form a hedge and would eliminate another bit of lawn. Two of them, Quick Fire and Limelight also belong to the hardy paniculata family. Limelight blooms in a shade of pale green in summer, turning to pink in the fall. Quick Fire buds open white then change to a gentle pink and then to a deep pink in the fall. It blooms a full month earlier than Limelight so a very long season of bloom is promised for the planned hedge. The third member of the hedge is our native hydrangea, H. quercifolia, or the oakleaf hydrangea. The leaves are indeed large and oakleaf shaped. They will turn beautiful shades of orange, red and burgundy in the fall. Unlike the paniculatas, the oakleaf hydrangea can only be pruned before August, before the shrub sets its buds for the following year. This is what is meant by a shrub that blooms on ‘old wood.’ Because the bush will still be blooming, not every blooming branch should be cut back at the same time. The mophead hydrangeas, H. macrophylla, is a more tender family that includes the pink or blue Endless Summer series. They bloom on old wood, and like the oakleaf hydrangea must be pruned before August. Hydrangea macrophylla normalis is the lacecap hydrangea and also blooms in shades of pink and blue as well as white. 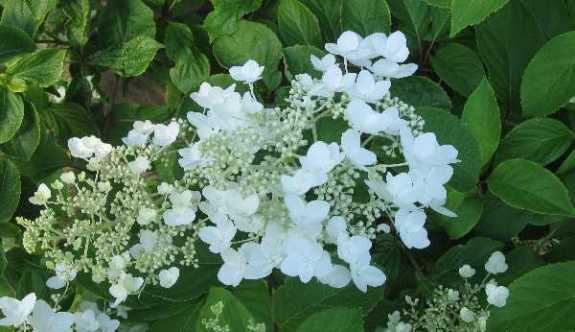 The final family of hydrangeas is the H. arborescens which includes the popular, low growing white Annabelle. Invincibelle is the deep pink form of Annabelle. Hydrangeas can take some afternoon shade, but here in Heath I do not need to worry about their getting too hot. Choose a spot where there will be plenty of room to grow and spread. They need the sun to thrive and bloom. They need to be well watered, especially in the first year or two. At the same time, they cannot be planted where they will have wet feet. The soil must drain well. Do not plant hydrangea too deeply. Dig a generous hole. Loosen the roots after taking it out of the pot and set it on the bottom of the planting hole so that it is just at soil level. Mix compost to the soil that is returned to the planting hole. Water well. Fertilizing should be done in the spring and in July. Do not fertilize any later in the year. I spread compost and composted manure around my hydrangeas. Hydrangeas have become very popular and your garden center is likely to have many varieties and you are sure to find one that will suit. I also love hydrangeas and have many in my yard. Unfortunately, the deer pruned my oak-leaf this winter which means I will be wrapping it with deer netting. I love Hydrangeas but always thought they needed shade. Then, late last year a good gardening friend of mine told me that paniculatas will grow in the sun. I now have four Hydrangeas and I’m so happy! Hydrangeas are one of my favorites. I have a deep purple one, and would love other colors, but only have so much garden space. I have a shooting star hydrangea – similar to the mothlight. I like how the plant stays in bloom for such a long period of time. I adore hydrangeas but they are iffy here if they do not bloom on new wood as well. 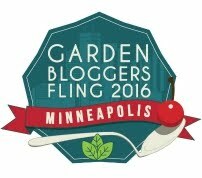 Lots of great info to help mine grow and bloom better. Hi, I am looking for a Hydrangea that would suit my front garden as a hedge, the down side is that I live near the sea, and it gets very windy at times, the plant that has taken my fancy is ‘Mothlight’ could you please let me know if this plant would be suitable. Richard – I don’t know about your climate near the sea, but I can tell you that my Mothlight grows where winter temperatures can plunge below zero and there is a LOT of wind. My Mothlight is very tall, but with careful pruning it can be kept to a more modest size.